Michéal Castaldo could be as big as Andrea Bocelli if he only had the exposure. How does one gush enough? An incredibly warm and smooth voice to rival anyone in the genre, every single one of Castaldo's albums is a must-have though I recommend starting with Aceto. He hits the balance exactly right with well known standards, his own compositions and contemporary songs that he translates into Italian himself (including Lion King's 'He Lives In You', 'The Sound of Silence', 'Stand By Me' and even 'Amazing Grace'). On top of it all, Castaldo is also a producer and mixer (he has a remix EP dedicated to 'Over the Rainbow'). Fans of the more emotive performers such as Mario Frangoulis and Alfie Boe will appreciate Castaldo all the more. Ciao Micheal, dropping by to wish you, Bozena and your family a Blessed Christmas and a Happy New year 2014! Peggy from Singapore! we have some great projects and concerts in the works for 2014 and we hope you will continue to join us on our journey. I am traveling from California to NY to see Micheal perform at the Christmas Concert at St Lucy's. I cant tell you how thrilled I am to finally get to hear him and meet him!!! I am sooo excited ! come join us for another Christmas concert. Join us for a holiday celebration with classical crossover tenor and light Italian opera singer, songwriter, composer and music producer Michéal Castaldo. An Italian-born Canadian who currently resides in New York, Castaldo studied voice with Maestro Pisapia, a protégé of the great Italian operatic tenor, Enrico Caruso. Castaldo studied at Oakwood Collegiate Institute in Toronto and Berklee College of Music in Boston. Saturday, December 7, 2013 @ 7 p.m.
For more information, call 212-729-4792. Im amazed at the emotion and the sound that comes from Micheal...even my 3 year old grandson wants me to play his CD's at the dinner table. A fantasic add to my collection of Italian Singer songwriters....cant wait to see him in person! 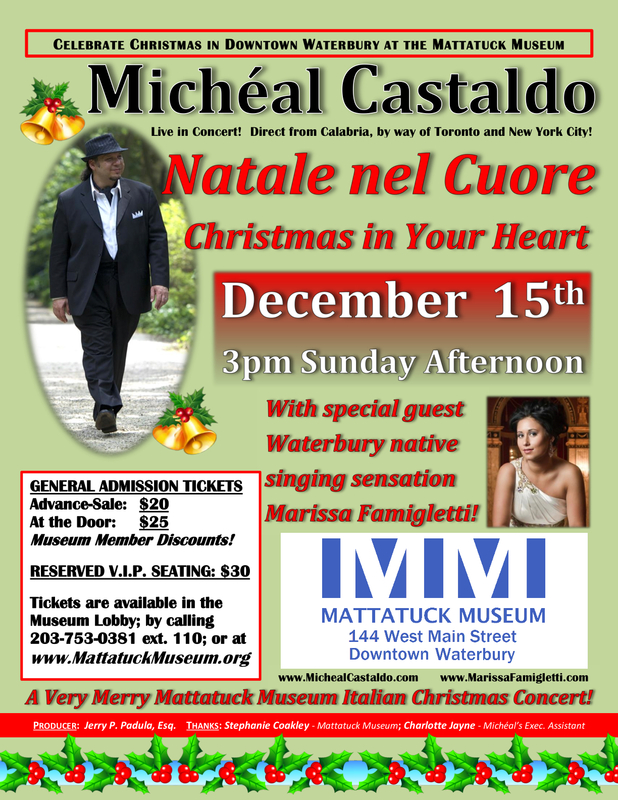 there will be a Christmas concert in Waterbury, CT starting at 3pm. stand by for more details coming soon. The comments is not for posting your voting numbers, guys. 2 more days to go ... join us tomorrow --- Sunday October 20th at the Suffolk Theater in Riverhead, Long Island, NY (the gateway to the Hamptons and North Fork). Our concert begins at 2PM. However, doors open and lunch will be served at 12;30PM. this theater is gorgeous the ambiance is sublime. some fans are traveling as far as PA, NJ, NH, MA, CT to come to this event. Love voting for Micheal~~~ such a talent ! Cant listen to his music enough! Christmas is coming...so excited to be able to hear Micheals Christmas music too! A fantasic add to my collection of Italian Singer songwriters.... cant wait to see him in person! Micheal Castaldo is an amazing singer! our fans are so passionate, loyal and very giving. so many new friendships have been forged by the simple act of voting and posting a vote #. it's the seed that is planted where new conversations start and fans begin to form bonds. thank you for your continued support in keeping our music relevant on CCuk and beyond. la tua voce arriverà MOLTO + IN ALTO !!! TE lo AUGURO DI CUORE!! !BELLA VOCE ! !E CALDA . Michael Castaldo..the voice of an Angel outstanding performer and Gentleman..! New York, NY — Michéal Castaldo is pleased to announce a special concert event entitled from Reggio to Riverhead to be held Sunday, Oct. 20, 2013 at 2 p.m. He will be performing a creative, multi-media, multi-sensory musical presentation at the Suffolk Theater in Riverhead, L.I., N.Y.
9846 I love Michael Castaldo’s enchanting music. Micheal Castaldo,he is a greatest singer...! simply the best !!! his voice is fantastic !!! Micheal Castaldo's voice and his interpretative ability are something exceptional. He really deserves more exposure and success! Micheal is a spectacular vocalist. He could sing me the phonebook! ciao a tutti - remember posting a comment in this section is not voting. Micheal you are indeed the best!! An authentic force of nature creatively, vocally and production-wise —all wrapped up in a timbre that is distinctly Michéal Castaldo, which makes him such a notable crossover marvel. WOW! GREAT STUFF! THANKS FOR THE LINK, LUCIE D..
kindly help spread the word about our next big concert on Sun October 20th. I have had the pleasure of staying at Michael's villetta in Gioia Tauro, Calabria. It was an amazing experience. I have also had his olive oil which is great, one of the best I have ever had. Michael's voice is amazing and truly should be listened to by all.His voice is a comfort to listen to.